Finally, a legitimate day. These three peaks lie on the “interesting” end of the ridge south of Little Cottonwood Canyon, joined by a long, meandering, undulating ridge, which is class 2-3 between Pfeifferhorn and South Thunder, and class 3-4 from there on. This part of the range, with its solid white granite, reminds me of the Sierra Nevada, and may even harbor decent alpine climbs. My original plan was to start at the White Pine trailhead and, after a long approach, climb the “Needle” couloir on North Thunder and make my way back toward the trailhead via the other peaks. 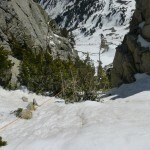 This would have made sense: climb the steep snow couloir first, while the snow is hardest. After getting a look at the upper Hogum Creek drainage, however, I ended up doing things backwards and downclimbing a mixture of slush, dirt, mud, and loose rock in the Needle. Whatever works. I got a good early start, fully loaded with gear. Having stubbornly refused to carry snowshoes on previous outings, I gave in and took them this time, re-learning a lesson I have learned before: the best way to ensure you won’t need snowshoes is to bring them. The trail/route to Hogum Creek crosses a couple of drainages, then cuts through a gap in Pfeifferhorn’s north ridge. From the gap, I saw that I would have to drop far down the drainage and reascend the snow apron on the other side to reach the Needle. If I went the other way, however, I could drop down Hogum Creek (the normal Needle approach) and hike the road back to my car. 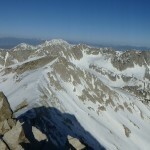 Choosing this option, I backtracked a bit, then climbed Pfeifferhorn via a snow slope to its east ridge. Even this early in the morning, small rocks occasionally fell from the face above. I was disheartened to see just how much the ridge twisted and dipped from here on, but wimping out would have continued a bad precedent. The first part of the ridge looked obnoxious, so I crossed the basin to the south directly to its low-point, where I took off my crampons for the day. From here to where it turns north, the ridge was mostly bare class 2-3 rock, an enjoyable change. A long slog across boulders and low-angle snow brought me to South Thunder, where I found the standard Utah mailbox, this time containing a dry register with one other entry this year. Things looked more complicated from here on, with a few steep-looking pinnacles in the way. The route I followed generally stayed on southeast, snow-free side. Getting past the first pinnacle was the crux, with a tricky (in boots) hand-traverse that made me take off my gloves followed by a short tunnel where the ice axe and snowshoes on my back caused problems. There were a few slightly tricky sections after this, but all were easier. I found a cord and rap ring at one, which I uncharacteristically left. The booty gods soon rewarded me, with a stiff, static, thin (7-8mm?) rope, tied to a tree on one end and cut on the other. I assume it is one of those light ropes used only for rappels, made stiff so it has more friction going through a normal-width ATC. While rapping on a single strand of the stuff would make me nervous, it may come in handy. All that remained was descending Hogum Creek. I used my snowshoes for a little while, partly to make my life easier traversing snow-covered deadfall, but mostly so they wouldn’t be entirely useless. Then I got past the snow, and things got ugly. While probably not as bad as George Creek, Hogum Creek is a hideous bushwhack. Staying well above the creek, I avoided the willows and found intermittent game trails. Unfortunately, I also ended up way too high as the creek dropped away over cascades. 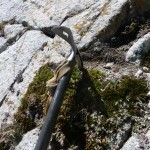 Standing and pulling on various plants, I eventually reached the canyon bottom, only to find more painful bushwhacking. Fed up, I headed straight for the road, soon finding a bit of a use trail in a clearing, which led to a convenient log crossing. This trail disappeared after that, but I soon found the main trail, which led east all the way to Tanner Campground, a mile or so from my car. I evidently looked lost and exhausted, because the campground host (-trainer) offered to drive me the rest of the way, an unexpected kindness given my previous experience trying to hitch a ride.